We were spoilt on the first two weeks of our Italian adventure. Tuscany gave us a pitch with fabulous views and mainly sunny weather. Going further south to Umbria we found ourselves on a five-star campsite and 40 degree heat. 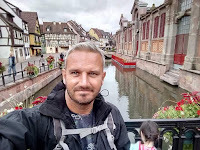 Our third week required that we started heading back north and we chose the Italian lakes. A few years ago we stayed in a hotel on Lake Garda. 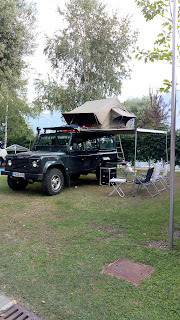 This time we decided to give Lake Como a try and booked Camping La Riva on the northern tip. I say northern tip but that's kind of stretching it a little. It's on the river slightly before it flows into the lake. Dinner is bubbling away and smells amazing. We purchased a bag of dried beans from an Italian Lidl and added a third of a chorizo sausage, onions, garlic and a yellow pepper, plus a carton of tomato passata. A little squeeze of harissa paste added for a spicy kick, and a low simmer for a couple of hours (might as well use the electricity now it's paid for). More beans are soaking ready for breakfast of eggs, beans and spam! Meanwhile the couple in the 'campervan' next to us with the two kayaks are having Pot Noodles and cigarettes. 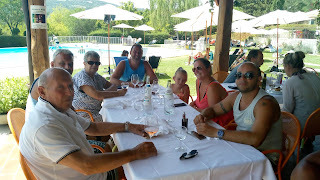 Heatwave Lucifer hit Italy just as we travelled south, for eight nights at Campsite Il Collacio in Umbria. Temperatures were around 35 to 39 degrees C and so we made the most of our campsite's two swimming pools for much of our days. My family flew out to join us for seven nights. The trip was a surprise for my mum's 70th birthday. All she was told was that Dad was taking her somewhere hot that wasn't by the sea. She thought my brother Ben and his family were only taking them to the airport and so the first surprise was revealed when they parked in the airport's long-stay car park and joined them on the flight to Rome.